Jonathan Ryan plays the three-manual organ completed in Fall, 2011, by Parkey OrganBuilders of Norcross, Georgia, at the Cathedral of St. John Berchmans in Shreveport, Louisiana. Reviews Jonathan Dimmock in The Journal of the Association of Anglican Musicians, April 2013: ". . . Ryan presents a very interesting program of pieces masterfully played . . . Ryan demonstrates exceptional technique, considerable depth of musicianship, imagination, and passion. This is a player to watch! . . . 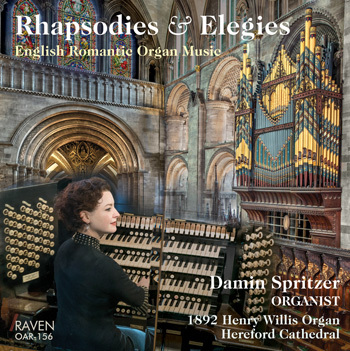 The organ sounds beautiful and is very well recorded." Reviews James M. Reed in The Diapason, June, 2013: Jonathan Ryan is one talented organist! Matched as he is on this CD with the new 54-rank Parkey organ in Shreveport's Catholic Cathedral (see The Diapason, January 2012) and some superb previously unrecorded music (as well as plenty of old favorites), this is much more interesting than the average run-of-the-mill organ demonstration disc. Ryan opens with a lively and spirited performance of Bach's Prelude and Fugue in D (BWV 532) in which we are quickly introduced to the performer's technical skill and the organ's varied musical palette. After three charming settings of Clarifica me Pater by William Byrd, the disc moves to the first of several most interesting musical selections—the first recording of the Three Liturgical Improvisations by the English church musician George Oldroyd (probably best known to most parish musicians as the composer of the Mass for the Quiet Hour), and although these performances here are divorced from the highly ritualistic Anglo-Catholic liturgical activity that they would almost certainly have been improvised to cover, they are played with tremendous feeling; the expressive, singing lines of Oldroyd's rich harmonic framework soar under Ryan's skilled fingers as he captures exactly the essence of this great emotive liturgical music. This is extremely beautiful, soulful music (particularly the first improvisation) and one can hopethat these three fine pieces will be heard more often in concerts, or perhaps as preludes to services of Choral Evensong. Three preludes on early American hymn tunes follow: Resignation by Zachary Wadsworth (receiving its first recording here, it is an interesting little piece with a constant sense of motion, and the well-known melody played on a soft solo reed stop), George Shearing's Come Away to the Skies, which begins with a delightful (almost) dance-like section, before transitioning into a somewhat comic theatre-organ style second half! The last of these three preludes is the lovely, gentle and meditative setting of Amazing Grace by Al Travis, organist of Broadway Baptist Church in Fort Worth, Texas. The final two pieces are, however, anything but meditative—quite popular works of the French organ repertoire, both pieces provide a glimpse into the extraordinary technical ability of this international (multiple) prize-winning organist: Fantaisie sur le Te Deum et Guirlandes Alleluiatiques of Charles Tournemire, an exciting, free-form fantasia based on the melody of the Te Deum laudamus; and finally the quite spectacular Placare Christe servulis (op. 38, no. 16) of Marcel Dupré, played here with all the great drama and excitement befitting such a cracking toccata—the Pontifical Trumpet may not compare to the great Cavaillé-Coll reeds on the organ of St. Sulpice, Paris, over which Dupré presided for many years, but put aside your purist tendencies, and allow yourself to get caught up in this incredible performance—Ryan will take your breath away. Raven has produced another of their fine booklets, with magnificent photographs and plentiful information about the repertoire, instrument, and performer; the clarity of their recordings never fails to deliver the impression of being seated in the room listening to a live performance, and this recording is no exception. The tenure of Johann Sebastian Bach as court organist in Weimar, Germany, from 1708 to 1717 saw a flourishing of his composition for the organ. Encouraged by the pleasure gleaned from the Duke of Weimar at such works, Bachs writing reached a high level of refinement and virtuosity. Probably dating from the first several years of Bach’s time in Weimar, the Prelude and Fugue in D Major bursts into life with an infamous set of three ascending D Major scales for the organists feet. Similar to the north German baroque stylus phantasticus, Bach writes the opening lines of this Prelude in a free, rather improvisatorial style intentionally designed to capture the listeners attention. After the invigorating opening section, a second and more substantial middle section seems to tip its hat to a sprightly Italian instrumental form. An unresolved final cadence to this middle section and the ensuing pause leads to the third and final section of the Prelude. This remarkable and highly unusual short passage features numerous heart- wrenching suspensions, some wandering of harmonies, and two simultaneous notes for the organists feet. While many organists interpret this passage with a rather full sound from the organ similar to the opening of the Prelude, here, I play it in a mournful, expressive, and somewhat Italian style. 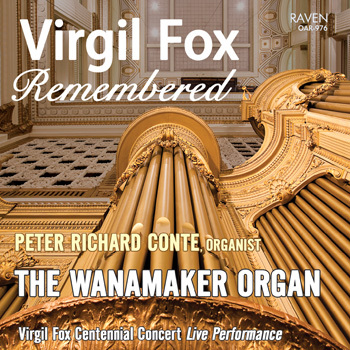 The delightful Fugue centers around a spinning musical theme whose steady stream of sixteenth notes makes a pedal part for the organists feet of notable virtuosity, especially by 18th-century standards. Despite openly maintaining his preference for Catholicism after Elizabeth I re-established the Anglican Church when her reign as queen (1558-1603) began, William Byrd was appointed to the Chapel Royal ca. 1570 and remained in royal employment for the rest of his life. Previously, he had been made organist/choirmaster at Lincoln Cathedral at the age of 20. Among his nearly 120 keyboard works are sacred pieces intended for the organ and secular pieces whose intended keyboard instrument is not always certain. Clarifica me Pater, a Psalm Antiphon most recently found in Roman-rite liturgy in Lauds during Passiontide, quotes John 17:5 in its text: Glorify me, Father, with thine own self with the glory I had with thee before the world was. Byrd’s three highly contrasting organ settings date from around 1560. Succeeding versets have one more voice than the previous; the first two reflect styles of earlier English composers, incorporating a high degree of angular rhythmic complexity. Unusual for the period, the second verset places the plainchant theme in the soprano voice. The third verset, demonstrating perhaps a later, more refined writing style, uses Clarifica me in the alto voice and employs highly imitative polyphony. Serving as a parish musician at several Anglican parishes of the Anglo-Catholic persuasion in southern England, George Oldroyd was no stranger to liturgy or Gregorian chant. The composer of some memorably beautiful choral music, Oldroyd happily marries the serenity found in post- Victorian British composition with the naturally uneven rhythm of chant in this set of quintessential British voluntaries. Originally published in 1938, each Improvisation quotes a Psalm passage in the score. The first of the three, and the only one not based on a plainsong hymn, uses an original theme that could easily have been plainchant, much like the imbibement of chant in compositions of Maurice Duruflé. The second Improvisation weaves its plainsong theme, the Vesperal hymn for the early Advent season Creator alme siderum or Creator of the stars of night, within Oldroyd’s texture of parallel triads. The third Improvisation is built around its plainsong theme, the hymn Verbum supernum for Lauds of the Feast of Corpus Christi, throughout and, employing a steady crescendo, stands as the only one to end with the full resources of the organ. The imaginative Czech composer Petr Eben, educated at the Prague Academy of Music following World War II, spent much of his time and career in composition though he also enjoyed international acclaim as a performer. A hero in his own country and decorated with the Czech Medal of Merit (2002), he also received honors from France and England. Religion, especially Catholicism, frequently plays a key inspirational role in his music, even if at a distance. In 1976, he received a commission from the Burgtheater in Vienna to write stage music to Goethe’s play Faust, which he later adapted for organ solo. The fifth of the nine movements portrays intoxicated students singing crude drinking songs as Faust and Mephistopheles visit the Auerbach tavern in Leipzig, hence the title Studentenlieder or Students songs. As one might expect with drunken bar songs, the pitch and rhythm are less than solid and yield an unpredictably amusing, if not also sometimes chaotic, quality to the music. Despite falling out of fashion at the time of his death, the music of J. S. Bach benefited from an enduring renewal of interest in the 19th century, especially by the time of Felix Mendelssohn’s 1829 performance in Berlin of the St. Matthew Passion. The consequent influence of Bach’s music extended to many important composers, including the great romanticist Robert Schumann, whose captivation with Bach in the 1840s yielded several works in the contrapuntal form of composition intimately connected with Bach’s works. Among Schumann’s works from this period are the Six Canonic Etudes, op. 56, written in April and May of 1845. In each of the etudes, Schumann employs a two-voice canon as the basis to create miniature marvels of characteristic and poignant lyricism and beauty. The Etude No. 4 in A-flat Major treats the canon much like a vocal duet in an art song with a clear solo/accompaniment texture. The slightly whimsical Etude No. 5 in B Minor and sublime Etude No. 6 in B Major more subtly place the canon between the tenor and soprano voice. Growing up as a child in Richmond, Virginia, I always loved the hymn tune Resignation, more commonly known by its associated text, My Shepherd will supply my need. So when Jonathan Ryan approached me with the idea of writing a Prelude on this tune, I was thrilled. As I spent more time with it, however, I realized the challenge of layering music on this particular melody: of its four phrases, the first, second and fourth are identical! So, in order to avoid dull repetition, I decided to set each of the hymn tunes four phrases in a different key. While the melody is played slowly and confidently in C major throughout, the accompaniment, reminiscent of Brahms’s op. 122 Chorale Preludes, starts in G major, then modulates to F major, modified C Lydian, and finally A minor. To me, this ever-shifting landscape of unstable keys mimics the hymns wandering spirit, which finally settles in the last cadence, like a child at home. All three hymn tunes in the set of preludes on this recording were first seen in the landmark shape-note hymn book Southern Harmony, originally published in 1835 by South Carolinian William Walker (1809-1875), a major figure in hymnody. A shape-note hymn was a popular 19th-century American manner of musically notating hymns in which different note shapes, such as a triangle or square, correspond to the notes pitch to assist singers in reading the music. The hymn prelude by jazz piano legend Sir George Shearing was published in 1977 in a set of nine pieces on early American hymn tunes transcribed from recordings made by Shearing during breaks on his concert tours. The youngest child of a blue-collar family in the southwest side of London, with only a few years of formal music study, Shearing managed to achieve considerable fame as a pianist, first in jazz and later in classical, and has numerous award-winning records to his name. In 1947, he moved to the United States, and was knighted by Queen Elizabeth in 2007 for his contributions to music. Shearing’s recent passing in New York City left a life of rich accomplishment and inspiration. Come away to the skies, my beloved, Arise and rejoice in the day thou wast born; On this festival day, come exulting away, And with singing to Zion return. Albert L. Travis is well established for his work in church music, having begun at age 12 to play for services at his home church, First Baptist in Batesville, Mississippi. Distinguished Professor of Organ (Emeritus 2008) at Southwestern Baptist Theological Seminary in Ft. Worth, Texas, since 1977 and organist at Broadway Baptist Church in Ft. Worth since 1978, he has numerous choral and organ works to his name as well as a long career in organ pedagogy and performance in both church and concert hall. As a recipient of a German Government Grant, he studied with Helmut Walcha in Frankfurt, and holds degrees from Oklahoma Baptist University, Syracuse University, and the University of Michigan. His setting of Amazing Grace was published in 1986 within a set of three preludes on American folk hymns. The inclusion of a countermelody in the Pedal throughout yields a particularly active, atmospheric texture in the preludes middle section in B minor. Amazing grace! How sweet the sound That savd a wretch like me! I once was lost, but now am found, Was blind, but now I see. With multiple symphonies, operas, chamber and piano works to his credit, Charles Tournemire is best known for his organ improvisations and closely-linked organ compositions. Serving at important institutions in Paris, primarily as professor of chamber music and organ improvisation at the Paris Conservatoire as well as organist at the Basilica of Ste-Clotilde, Tournemire’s dramatic temperament vividly manifests itself in his improvisations. LOrgue Mystique, composed from 1927 to 1932, stands as his largest organ work with a unique scope comprising written compositions in an improvisational style for Sunday and Feast Day Masses throughout the ecclesiastical year as based primarily on Gregorian chants with movements for the Entrance, Offertory, Elevation, Communion, and an extended postlude. Tournemire’s Fantasie sur le Te Deum et Guirlandes Alleluiatiques is not only appointed for the last Sunday of the liturgical year, it is also the last of the LOrgue Mystique cycle he composed. The final movement, typical of those in LOrgue Mystique and based on the great and ancient hymn, the Te Deum, is a large fantasia in free form lasting longer than all four other movements combined. The entire movement, with its modal harmony, grand scale, fiery eruptions, and frequent patterned accompaniment of a single melody, is quintessential Tournemire. A great virtuoso organist of the 20th century who was also a highly influential teacher and composer for the organ, Marcel Dupré wrote in numerous forms for the instrument, including preludes, fugues, symphonies, and chorale or chant-based works. Many of these works are not unlike his famous improvisations at the magnificent Church of St-Sulpice in Paris where he was titulaire organist for some 37 years. While in his native Rouen in 1942, Dupré was shown the unmarked grave of Jean Titelouze (c.1563-1633), who is widely considered the father of the French organ school. Titelouzes first of only two surviving collections of organ music dates from 1624 and contains versets on twelve chant hymns from the Divine Office. Inspired by his visit in homage of this patriarchichal figure, Le Tombeau de Titelouze was completed the following year and contains comparatively brief pieces on sixteen Divine Office plainsong hymns, most of which are found in Titelouzes 1624 collection. The last of these sixteen, Placare Christe servulis, the hymn appointed for Vespers on the Feast of All Saints, bursts into being as a brilliant toccata in which Placare Christe is heard first in the soprano voice and then thunderously in the lowest bass voice. Jonathan Ryan is Associate Director of Music at Christ Church (Episcopal) in Greenwich, Connecticut, and is a concert organist under the management of Karen McFarlane Artists. Acclaimed for his strong communicative skills in numerous styles, exceptional use of the organs capabilities, and bold programming, Jonathan Ryan has received six First Prize awards at international and national organ playing competitions. His performances at celebrated venues throughout the United States, Germany, France, and the United Kingdom explore a repertoire spanning the 16th to 21st centuries. In 2009, he received First Prize in the Jordan International Organ Competition which is conducted only twice in a decade and awards substantial cash prizes conferred by a highly distinguished jury. At the 2009 Jordan Competition, he also received the Letourneau Prize, given for the best performance of a newly commissioned work for organ and percussion. He has also received First Prizes in the 2006 Arthur Poister Organ Competition, the 2006 John Rodland Scholarship Competition, the 2004 Albert Schweitzer Organ Competition (Young Professional Division), and the 2003 Augustana Arts-Reuter Organ Competition. A native of Charlotte, North Carolina, Jonathan started playing the organ at age eight. He studied with André Lash before entering the studio of Joyce Jones at Baylor University. Studying organ, improvisation, and church music with Todd Wilson at the Cleveland Institute of Music, he received a Bachelor of Music degree with academic honors and also served as Todd Wilsons assistant at Church of the Covenant. As a student of David Higgs, he received a Master's degree from the Eastman School of Music where he studied improvisation with William Porter. Jonathan's solo performances have taken him to numerous prominent venues including the Cathedral St-Andre in Bordeaux (France), the Nikolaikirche in Leipzig and the Marienkirche in Lübeck (in a nine-concert tour of Germany), Truro Cathedral and St. Pauls Cathedral in London (among others in the UK), the Co-Cathedral of the Sacred Heart in Houston and many other concerts in the United States, and major festivals and conventions, including National Conventions of the Organ Historical Society and the Spotlight Series of Piccolo Spoleto (Charleston, South Carolina). Parkey OrganBuilders completed the pipe organ for the Cathedral of St. John Berchmans, Shreveport, Louisiana, as the firm’s Opus 12 in Fall of 2011. The tonal design was the result of a collaboration between Dr. Jim Dorroh of Birmingham, consultant; Justin Ward, then-Choirmaster at the Cathedral of St. John Berchmans; and Phil Parkey of Parkey OrganBuilders. The organ reflects a diversity of tonal design which is comfortable for use as a service instrument, yet perfectly capable of performing as a recital instrument. Our focus was to keep the organ flexible while maintaining integrity of chorus in the development of the tonal structure. Jonathan Ryan’s excellent skills display the variety of color and volume ranging from the soft flutes of the Choir Division to the majesty of the Pontifical Trumpet. He provides an excellent opportunity to hear all facets of the organ. We were especially appreciative to Mr. Ryan for his interest in playing our Opus 12 in his first commercially available recording. I am certain that his musicianship will be highly respected and heard in the years to come. We are humbled by his selection of our instrument and look forward to future events! 2-CDs for the Price of One!